The Tipsy Goat is located at 159 E. Thousand Oaks Boulevard, in the old Enrique's Mexican Restaurant (for you old timers) and adjacent to Outback Steakhouse. With its unique name, The Tipsy Goat brought a lot of curiosity in the months leading up to opening its doors on March 14, 2011, just in time for Saint Patrick's Day. I made it over to The Tipsy Goat for the first time on Thursday, March 31st during happy hour and was pleased with what I experienced. First off, there is plenty of parking available behind the restaurant, so just drive to the back via the driveway to the left. If you walk in through the back, as I did, you'll first see a room with two pool tables (bring $1 per game) and several TVs. Then as you walk towards the front you'll see a shuffleboard on the left, then the next room has a dartboard and several tables, leading to the large outdoor patio of the restaurant. The most popular areas when I was there was the outdoor area and the bar, which has probably 10 to 12 smaller tables with barstools. Then there's one more room full of comfy leather couches. Mind you, as a busy dad, I don't consider myself a bar expert anymore, but this place was fun and low key. The servers were laid back and we enjoyed the cold beer and tried several appetizers - the pulled pork sliders and the chicken wings. They were bargain priced before 7pm (only $5) and hit the spot. Loved the sliders, which came with cross-cut fries. I'm not a big wing guy but I liked these because they were large wings, plenty of meat, not overly messy (I got enough messes to clean up at home :>). Otherwise, the menu seems to have a decent array of tasty sounding items, including Irish themed goodies like Shephard's Pie and corned beef and cabbage. 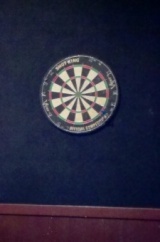 So we enjoyed hanging out, played a few games of darts, one game of pool, ate, and had a good time. I also noticed it was family friendly, with several kids and families. We left around 8:30 p.m. and the crowd was changing by then as us geezers realized it was bedtime. 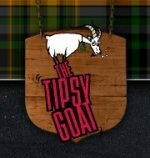 Visit www.tipsygoat.com or call 805.494.9996 for more information.